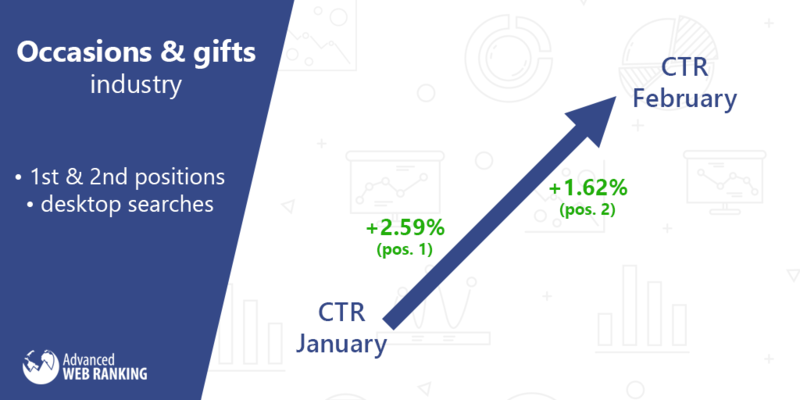 We’ve been tracking CTR evolution for about half a decade now, and since we’re updating the values each month, we figured it’d be useful to also draw some brief conclusions for you, one month to another. Whether your clients’ websites are from an industry affected by these CTR changes or perhaps you’re seeing traffic spikes for commercial queries, you may need to explain your clients what’s behind the KPIs changes they’re seeing in your reports. I hope and honestly wish this monthly digest would come in handy for you and provide some facts and numbers you can base your strategies on. Websites ranked 1st for both desktop and mobile searches experienced an almost insignificant increase in CTR (0.45% for desktop and 0.42% for mobile). Regardless of the query type (1 word, 2 words, more), all websites ranked first registered a lean increase on all devices (desktop & mobile) in February. Location intent queries brought websites ranked on 1st position the highest increase in CTR (4% on desktop and 6.32% on mobile). Also, websites ranked 1st for commercial queries registered a significant increase on both desktop (2.15%) and mobile devices (3%). February’s headline is related to the Real Estate industry. 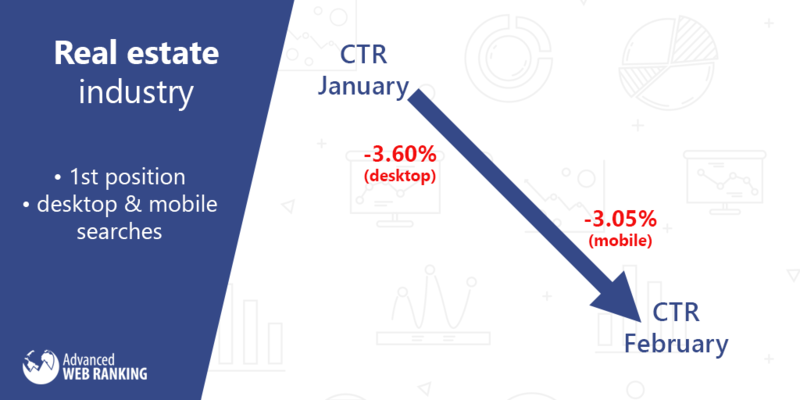 Websites ranked 1st experienced a drop in CTR by 3.60% on desktop searches and by 3.05% on mobile searches, when compared to the previous month. An interesting stat comes from the Retailers & General Merchandise industry, where the first two ranked websites recorded a drop but only for searches made from mobile devices: a 2.92% loss in CTR for the websites ranked first and a 1.44% loss for those who rank on second position. Occasions & Gifts industry could be considered last month’s winner. 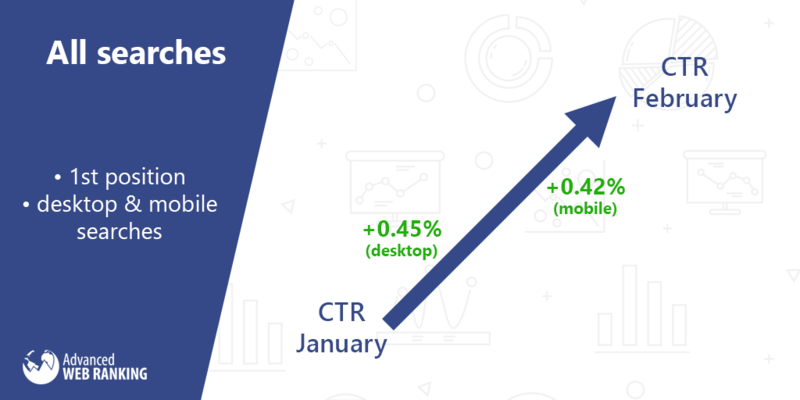 More precisely, sites ranked on both 1st and 2nd positions for desktop searches got a boost in CTR (by 2.59% and 1.62% respectively). So how about you? Have you noticed any changes in CTR for your website from one month to another although the rankings remained steady? Or maybe only for long term tail queries on a certain device? I would love to hear back from you! What query variances are included in this bucket (i.e. address, phone, near me)? Also, how are you classifying clicks in this instance (ex: to a website)? We consider location intent queries defined as having the following words in the keyword: near, nearby, from, directions, airport, route, maps, etc. The study is based on data collected from Google Search Console from 3,795,153 keywords and 74,138 websites, with ‘International’ and ‘Exact’ options selected. The first one shows all data, without applying any location filter, while the latter one shows the exact position from Google Search Console. For more accuracy, only the keywords that have at least 500 impressions per month have been taken into account. Thanks for the report, is there any other notes you would provide me with? For me I noticed a decrease in CTR, however I didn’t change anything in title/description, and also the avg. position still the same, don’t really know if it’s related to what you published or something else related to Google March updates. Also I think increasing in CTR for occasions and gifts would be due to that there was a few important occasions like “Valentine’s day”, or you think it’s related to something else? What about other industries, any data you can share for more industries? There were other changes in CTR between January and February updates, of course, but we tried to sum up all the significant highlights found in top 3 results.